The spontaneous book series seeks to engage in a group thinking and doing process that produces a result in a short period of time: capturing, processing and producing content simultaneously. 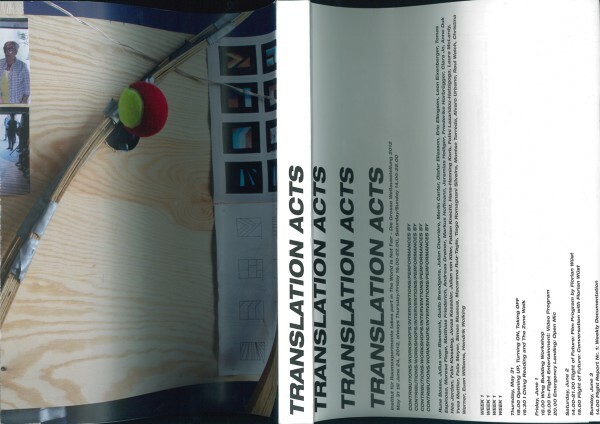 Translation Acts is the most comprehensive edition within the spontaneous book series. It documents programming events planned by the Institut für Raumexperimente spanning the full, four-week duration of The World is Not Fair – The Great World’s Fair 2012, a project initiated by architectural collective raumlaborberlin in cooperation with Hebbel am Ufer theatre in the former balloon hall on the grounds of the former Tempelhof airport in June 2012. The institute aimed to design a social infrastructure in the form of a multi-programmable system of bleachers, which could function as many different parliaments of reality. Each configuration of the mobile architecture was a tool informed by participants’ needs to inflect the relationships and speeds of entering the space and being caught in the space, simultaneously inside and outside the flows of people, which in turn helped shape the content of each event. Each artist in the institute was given a chance to propose programming and artworks and co-produce the content. In the course of the project, we performed our politics, we read our own futures, and we became an open microphone, transmitting pirate signals and amplifying bird songs. We learned the language of extinct species, exercised and conducted art and practiced translating an ecology of inspiring ideas and intimate feelings into an ecology based around the necessity to connect into and with publics. The translations derived from acts of engagement, detours of insecurity and possible misunderstandings in order to give learning a chance. The publication collects four weeks of events in a continuous chronological flow of images and transcripts and documents all participants’ contributions, colored inserts turned 90°.